Via Twitter, the North Dakota Senator is pushing the “Fairness for High Skilled Immigrants Act,” which was also championed by former GOP Rep. Kevin Yoder until he lost his 2018 election. But Cramer’s bill does not offer fairness or safeguards to the many Americans who are losing careers or starter jobs to the imported army of roughly 500,000 Indian workers and recruiters, said Dawn Collins, a former vice-president at J.P. Morgan Chase bank. The Americans were pushed out of their jobs when Indians signed up with U.S. and Indian outsourcing companies to take the Americans’ middle-class jobs. Their Indians’ reward is very low wages — plus the chance of eventually being paid with green cards and citizenship, Collins said. Collins now leads Protect U.S. Workers which is trying to curb the huge white collar outsourcing industry. Her advocacy task is difficult, in part, because many U.S. workers need to hide their identity so they will not be blackballed by the Indian recruiters who are hired to fill many jobs in the U.S. technology sector. For example, Collins has been using the name “Dawn Casey” to shield herself from retaliation by the industry. Cramer’s pending bill, she said will greatly worsen the outsourcing problem by encouraging more Indians to take U.S. middle-class jobs. Indian graduates have already displaced many Americans who operated and maintained the computer systems needed by banks, airlines, insurance companies, hospitals, and many other industries — despite the greater risk of privacy breaches, security vulnerabilities and corporate discrimination against young American graduates, she said. Cramer’s bill will help the alliance of Indian outsourcing companies and U.S. investment firms to outsource many more Americans’ jobs in healthcare, accounting, and engineering jobs, she said. Instead of helping companies import cheap workers, the government should encourage and train young Americans to fill new jobs, said Ron Marsh, associate director of the computer science department at the University of North Dakota. “I’d love to see more Americans get into the jobs,” he said. Cramer has tweeted his support for the 300,000 Indian visa workers, who are described by Cramer and the legislation as “immigrants.” But the visa workers are not immigrants until they get green cards. The Fairness for High Skilled Immigrants Act is about exactly that: fairness. Cramer also endorsed an op-ed by an Indian-born legal immigrant who is now helping run a political group for Indian visa workers titled Immigration Voice. The group is advised by Leon Fresco, a D.C. lawyer who served as Democratic Sen. Chuck Schumer’s top legal aide in the disastrous “Gang of Eight” amnesty in 2013. Wonderful piece by my #SOTU guest and good friend, @debjyotidwivedy. Cramer’s outsourcing bill is being led by GOP Sen. Mike Lee and Democratic Sen. Kamala Harris. Their February 7 statement says, “the bill has also been endorsed by Immigration Voice, Compete America Coalition, the Information Technology Industry Council, Google, Microsoft, The Heritage Foundation, La Raza, and many others.” The bill is numbered S. 386. The matching House bill is numbered H.R. 1044. The bill works by lifting the current “country cap” immigration rules. Those rules say that people from one country can receive up to seven percent of the 140,000 green cards sponsored by employers each year. The goal is to add diversity to companies’ hiring of foreign workers. In practice, loopholes allow Indians to double their inflow, with roughly 14 percent of the annual allotment each year. That 14 percent provides green cards to roughly 23,000 Indian workers, spouses, and children each year. But that annual supply of 23,000 cards is too small for the huge wave of Indian workers who have been sponsored for green cards by U.S. and Indian outsourcing firms. The result is that roughly 630,000 Indian visa workers, spouses, and children are slowly moving through the line for green cards. The huge population of temporary workers is made possible by Congress, which allows H-1B visa-workers to endlessly extend their six-year stay in the United States once their company sponsors them for green cards. That extension law has been used by the Indian outsourcing companies to greatly expand their supposedly temporary H-1B workforce in the United States to more than 650,000 workers, even though companies can supposedly bring in only 85,000 H-1B workers per year. Cramer’s bill would end the “country caps” and allow the visa workers to get their green cards on a first come, first served basis. In practice, the Indian-run middle-class outsourcing industry is so large that Indians visa workers likely will get nearly all of the green cards for the next several years, alongside a smaller inflow of visa workers from China, the Philippines, and other nations. Applicants from many smaller countries would be forced to wait behind the outsourcing industry’s line of several hundred thousand Indian visa-workers and their family members. Breitbart News asked Cramer to explain his support for the visa-worker reward legislation. The Fairness for High Skilled Immigrants Act meets the needs of my state of North Dakota. Without adding any new green cards, this bill creates a ‘first-come, first-served’ system and alleviates the backlog caused by arbitrary per-country caps. As we already face a significant labor shortage, losing workers who have come to our state to fill these jobs, but are then forced to leave based solely on where they were born, could be devastating. Cramer’s statement correctly says the bill will not add new green cards. But the legislation will allow the Indian outsourcing companies to reward their workforce with a much larger share of the annual allotment of 140,000 green cards. The larger reward will allow the outsourcing companies to recruit hundreds of thousands of additional Indian workers for U.S. jobs by offering the incentive of a fast-track to citizenship. Those additional workers will take more outsourced jobs from Americans, and will stay in the United States for many years once they are sponsored for green cards. The next wave of Indian outsourcing workers can easily get work permits via the uncapped CPT, OPT, H-1B, and L-1 visa-worker programs. These visa-workers have already displaced Americans in a very wide range of white-collar jobs, including information technology, healthcare, accounting, industrial design, engineering, fashion, science, and teaching. The MyVisaJobs site shows the number of requests for visa workers by industry, employer, state, town, career and job title. Cramer’s anti-backlog “country caps” legislation may actually create a bigger backlog, warns the Congressional Research Service. “Shorter wait times for [green cards] might actually incentivize greater numbers of nationals from India, China, and the Philippines to seek employment-based [green card] status,” a CRS report warned legislators. “If that were to occur, the reduction in the number of approved petitions pending might be short-lived,” said the December 2018 report. That is just your skewed viewpoint about “another wave of Indians to seek outsourcing work”. You just made that up. Which study or theory or quote or research of some policy institute do you have to reach that conclusion? You just made that up from thin air about “another wave” just because it fits into your “Indian invasion” narrative. Other than bunch of anti immigrants whose only solution to the backlog is to kick out everyone, you can’t cite any credible source to support this “another wave….” theory, can you? Cramer’s offer of green cards to the visa workers would also make his state’s labor shortage worse in the short term, because Indian workers who get green cards will likely leave the state’s cold climate for jobs in warm and wealthy states, said Collins. For now, many Indian visa workers in North Dakota cannot quit their jobs because their employer can cancel their visa or refuse to file for a green card. Even after an employer files to get a green card for a worker, the employee cannot change jobs until he or she gets the green card. That federal rule creates a huge captive workforce which will work long hours for low wages in isolated places — such as North Dakota — to finally get the green card. A very hard-to-measure caveat regarding those numbers: 216,000 EB-2 petitions for Indian nationals may be for 100,000 (or 50,000) individuals. USCIS approves multiple petitions for people because they change employers, get promoted, etc. during the decade-long wait for a GC. Indians activists say the green card line also lengthens and shortens as visa workers arrive or leave the United States to get good jobs in India. The outsourcing bill is backed by a wide variety of U.S. firms. In 2018, these companies backed a prior version of the bill sponsored by Rep. Yoder. Deloitte, Microsoft, Facebook, Amazon, and many other companies back the legislation, partly because it would help them get green cards for their Indian visa workers. For example, the legislation is backed by FWD.us, which was formed by a group of West Coast investors to preserve their inflow of foreign white-collar labor. The bill is also boosted by the universities who help their foreign students get work permits via the OPT and CPT programs. The two programs now get about 100,000 foreign students and 300,000 foreign graduates into the U.S. workforce for up to three years. 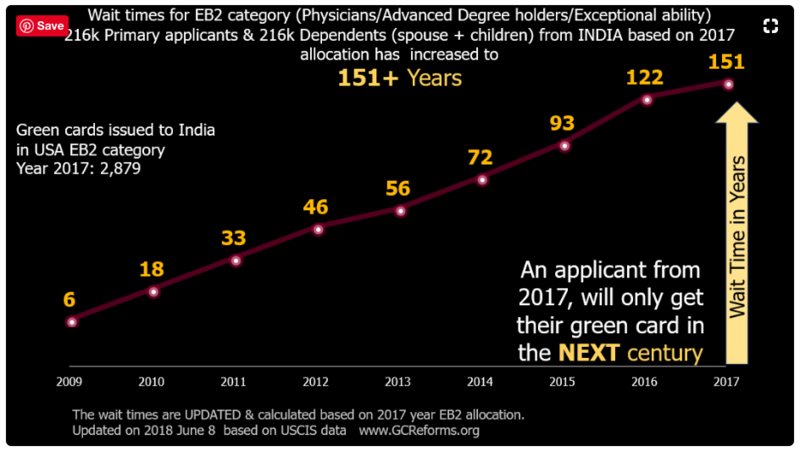 Many Indians use the OPT program to jump into the H-1B program and then into the green card line. But Americans strongly oppose legislation which allows companies to hire foreigners instead of fellow Americans. For example, Rep. Yoder’s 2018 support for the country caps bill generated opposition from college-graduate Americans, and he lost his suburban district in November. Most Americans wish to welcome migrants, but the “priority or fairness” polls — as well as the 2016 election — show that voters put a much higher priority on helping their families and fellow nationals get decent jobs in a globalized, high-immigration economy. Enjoyed helping send @RepKevinYoder packing. Cramer suggested that the outsourcing bill would provide more workers to North Dakota companies. But he did not suggest that North Dakota companies could solve their labor shortage by raising wages. North Dakota’s unemployment rate is below three percent, but federal data does not show that companies in the state are raising wages to attract American workers from other states. The Bureau of Labor Statistics says wages rose in the region around North Dakota by only three percent in 2018. In contrast, wages rose by 5.2 percent in the Minneapolis region. Wages are already lower in North Dakota than in other states. However, North Dakota’s energy companies solved their labor shortages in the Bakken oil fields by recognizing the law of supply and demand. They offered higher wages and were able to hire local workers and out-of-state Americans. Advocates and companies repeatedly claim there is a labor shortage of high skill workers. However, the Indian workers are a mixed bag. Some get high end jobs at Google and Apple, but many others are so unskilled that they must be trained by the Americans they are replacing. Tests show that immigrants with foreign college degree score far lower than Americans graduates. This claim of a labor shortage, however, is also complicated by a judge’s decision in 2015 that Silicon Valley CEOs conspired to suppress the salaries of up to 64,000 workers. “The settlement, if approved, would avoid an embarrassing trial for the tech giants, whose top executives, including late Apple CEO Steve Jobs and Google CEO Eric Schmidt, were accused of agreeing not to poach from rivals,” the San Jose Mercury News reported. Breitbart News asked Cramer if the country caps legislation will be tied to reforms of the many visa worker programs. “This is a standalone bill,” the statement responded. One victim of the national outsourcing trend is Donna B., who started a software career when her husband divorced her. She is now retired to a small town in Arizona and earns so little money that she is not required to pay off the $50,000 in student loans she owes from her software education in 1989. Many of the job interviews were conducted with Indian recruiters employed by the Indian-run the outsourcing companies, each of which has an economic incentive to fill jobs with cheap Indian H-1Bs, not with Americans, she said. “I’ve gotten calls and I’ve gotten emails from Indians [when applying for jobs] … It just goes nowhere,” she said. The job at Dell [senior director of development.] required weekly trips to the company’s headquarters in Texas, which proved a burden, and he left the job in 2011. His search for the next job was exhausting and fruitless. In 2013, when the PBS program NewsHour visited Connecticut to do a story on older, unemployed Americans, the episode centered on an interview with Mr. Weglarz. The Cramer bill offers no protections to Americans. But GOP Iowa Sen. Chuck Grassley is developing a bill that would reform the huge H-1B visa worker program which is pushing many young and mid-career Americans out of starter jobs and out of their professions. The Cramer statement estimated that there are 500 H-1B recipients in the state. However, data collected at SAITJ.org by a group called Save American Information Technology Jobs showed North Dakota employers asked for 348 new visas and for extended visas for another 102 workers in 2017. Only one-third of requests for new visas are approved. Each new visa or extension visa lasts for three years, so the SAITJ data suggests that more than 600 H-1Bs are working in North Dakota jobs. 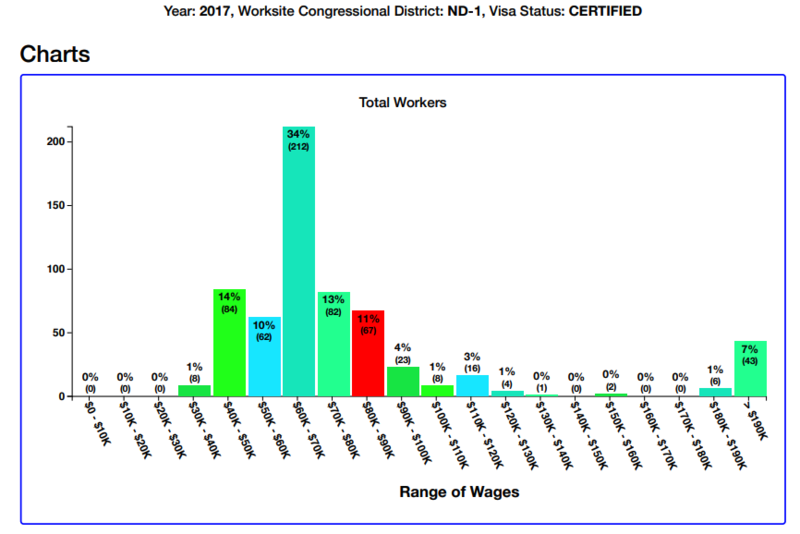 The SAITJ data is organized by political district, and it shows the number of workers, their job titles, their employers and promised wages for all the 2017 H-1Bs workers in each member’s district. The data was used by critics to help defeat Rep. Yoder in 2018. The MyVisaJobs site shows data for prior years and suggests a resident workforce of between 500 and 600 H-1Bs in North Dakota college graduate jobs. Nationwide, at least 1.5 million American college-graduate jobs are being outsourced to foreign graduates via the H-1B, L-1, OPT, CPT, J-1, H4EAD, and TN visa programs. That number, however, understates the job-loss impact because many of the Indian visa-workers are also managing teams of workers in India who are doing jobs once held by other Americans. When I was first elected to the House, a radiation oncologist in rural North Dakota- the only one in a 200-mile radius- was unable to re-enter the country due to administrative processing delays related to her visa. Immediately, constituents from several cities throughout the area began reaching out. This is just one of many examples of how losing these high-skilled immigrants- who are already here- can have an extremely harmful for North Dakota. Removing these arbitrary caps will meet the immediate needs of my state while upholding our nation’s founding principles of fairness and equality. If Cramer’s bill becomes law, said Collins, many of the Indian visa-workers who get green cards will leave North Dakota for warmer climates. Those former visa-workers, she said, will be replaced by other visa workers, not by well-paid Americans. The SAITJ data, for example, shows that employers in 2017 tried to hire 55 H-1Bs healthcare workers for North Dakota jobs. For example, Walgreen, CVS, Rite-Aid and other companies are trying to import hundreds of H-1B pharmacists to replace American graduates. When visa workers replace American healthcare experts, said Casey, the quality of healthcare drops and the local economy loses revenue. “When wages decrease in local hospitals … people stop buying things,” Collins said. In their 2017 applications for H-1B visas, North Dakota employers promised they would pay 72 percent of the visa workers in the state at “entry level” or at “qualified” pay levels. One-in-six of the 2017 requests promised to pay the visa workers less than $50,000, according to SAITJ. Roughly half of those H-1Bs were to be paid less than $65,000 a year. In reality, many H-1Bs are paid less than promised because they are pressured to make secret payments back to corrupt managers who steered them into the U.S. jobs. Cramer’s office did not answer a Breitbart question asking if the Senator would push for legislation that would help train more Americans in North Dakota to become doctors and nurses. “No one can compete with American workers when they’re given a fair and level playing field, which has not happened for decades,” Trump said. But the federal offer of green cards to foreign workers tilts the field decisively by providing huge government-funded prizes — work permits, green cards, and citizenship — to foreign workers who agree to take Americans’ jobs at lower wages, work longer hours, live in overcrowded apartments, move from city to city, and complain less, said Jay Palmer, a software expert who forced to train his Indian replacement when he was pushed out of his Florida job at Disney Corp. Palmer’s sudden replacement in 2015 by Indian visa-workers was fully legal, and part of a stock-boosting move by Disney’s CEO. San Jose, CA, December 1, 2017 – Kotchen & Low LLP filed a complaint today on behalf of a proposed class of employees and applicants alleging that Wipro Limited discriminates against non-South Asians in hiring, promotions, and terminations. Plaintiffs allege that Wipro discriminates against non-South Asians in four ways. First, Wipro uses fraudulent H-1B visa applications to secure South Asian workers from overseas, and gives preference to those workers ahead of American workers. Second, Wipro gives substantial preference to South Asian applicants when hiring for local positions in the U.S. Third, Wipro consistently promotes more South Asian employees than their non-South Asian counterparts. Fourth, Wipro terminates non-South Asians at disproportionately higher rates. At least 80% of Wipro’s employees are South Asian, despite South Asians making up about 12% of the U.S. IT Industry, according to the complaint. The named plaintiffs are James Philips and Robert Saemian, who are both former Wipro employees who allege that Wipro discriminated against them on the basis of race and national origin. Talent Acquisition Unit Observations: Recruiters in Talent Acquisition observed that Indians were highly favored, and it was extremely difficult to move non-South Asians ahead in the hiring process. Non-Indians were regularly rejected as being “not a good fit,” – an Infosys euphemism for “non-Indian.” This discrimination is on-going. In 2016 for example, an Infosys manager in their Talent Acquisition Unit observed that of Infosys’ 2,900 hires in the United States, 2,200 (76%) were Indian. She observed a similar hiring disparity in prior years. Applicant Data Manipulation: Infosys manipulates applicant tracking data in such a way that consideration of non-South Asians and non-Indians is minimized, and the hiring of South Asians is maximized. For example, recruiters have observed that non-South Asian applicants were repeatedly deleted from Infosys’ applicant tracking system, forcing one recruiter to keep a separate spreadsheet of applicants on his computer. Recruiters have also observed South Asian applicants, located by Infosys’ “sourcers” in India, manually entered into the applicant tracking system despite those individuals not having formally applied, thus streamlining the hiring process. Individuals sourced in this way were moved “to the front of the line” ahead of applicants in the U.S. A recruiter also observed that applications for United States positions were regularly not reviewed, and in 2016, approximately 11,000 to 12,000 were rejected en masse. Americans also are excluded from jobs because Indian visa-workers sometimes pay Indian employers to get hired in the United States. nearly 200 workers may have been brought in under the phony applications. The employees were forced to pay [the CEO’s] companies a partially-refundable ‘security deposit’ of as much as $5,000 for the visa filings, regardless of whether they were assigned to any projects that provided them with income. When asked about Cramer’s bill, North Dakota computer science professor Marsh said he wants more young people from his state to get into information technology and other technology sectors. The outsourcing legislation would remove the so-called “country caps” on the annual allocation of green cards. Those caps are intended to diversify foreign workers who are imported into the United States. The country caps are set at 7 percent for each country, large and small. That cap helps people from smaller countries, such as Kenya, Vietnam or Argentina, but is a problem for people from large countries, such as China, India and the Philippines. However, there are several loopholes in the rules. Those loopholes double the Indians’ share to roughly 14 percent –not 7 percent — of the 140,000 employer-sponsored green cards each year. That 14 percent is roughly 23,000 green cards for Indian visa workers and family members each year. But there are more than 306,000 Indian workers in the three lines to get the employer-sponsored green cards, plus roughly 326,000 spouses and children. The Indian population in the waiting line is so huge because federal law says that visa workers who are sponsored for green-card can endlessly renew their temporary visas once their employer puts them in the green-card line. This extension rule gives foreign companies a huge incentive to offer green cards to their foreign visa-employees. They can import just a few hundred temporary visa workers each year, and then use the green card line to extend the workers’ stays in the United States. For example, Cognizant, an Indian outsourcing firm, put up to 22,000 of its temporary visa workers into the permanent green card line from 2008 to 2017. There are three different lines to get green cards, the rules are very complex, and the verification of claims is a difficult task for the federal government. The EB-1 line for is people with who claim “extraordinary ability.” This line is fast — the Indians who joined this line in October 2017 are now getting their green cards. This EB-1 group comprises 13 percent of the Indian backlogged visa-workers (plus spouses and children) and they get 58 percent of the green cards given to Indians. Many members of this group claim to be managers in India who were sent to the United States to transfer U.S. software and healthcare jobs back to offices in India. The EB-3 line is for people who have bachelors’ degrees and who compete directly against American graduates for jobs that do not require high skills. Indians in this group comprises 18 percent of the Indian applicants, and they get 29 percent of the visas. Indians who got into the EB-3 line in April 2010 are getting their cards this year. This EB-3 line is relatively fast because few Indian graduates are fortunate to get on a fast track into the H-1B or L-1 visa programs which allow employers to quickly sponsor them for citizenship. That 10-year wait is a small price for the greatest prize on the planet — a U.S. green card and subsequent citizenship — for the workers’ spouse and children, their parents and inlaws, and all of their descendants into the future. The EB-2 line is for people with masters’ degrees. Indians in this line comprise 69 percent of Indian applicants, and they get 13 percent of the Indian green cards. This is the longest line, and many of the pro-migration activists and Indian activists claim that Indians in this line have to wait 151 years for a green card. But the “visa bulletin” from the Department of State says that the EB-2 Indians who filed in April 2010 will get green cards this year. The EB-2 line is getting longer for two reasons. Many Indian visa workers spend years trying to get sponsored for green cards. Often, they get their initial work permits via the huge “Optional Practical Training” program at U.S. colleges and universities. Many of those OPT Indians get hired by lower-status staffing companies and become low-status contingent workers who can be quickly placed into new jobs in distant cities before American graduates even get an interview. These OPT workers try to get into the H-1B program, often by extending their stay with another OPT work-permit by buying a masters degree at a third-tier college. That master’ degree pushed them — unwillingly — out of the EB-3 line and into the EB-2 line. Second, this EB2 backlog did not exist before 2005. But the backlog has been created by the U.S. and Indian firms who are packing their temporary workers into the semi-permanent EB-2 line. So the line grows because more experienced workers are put into the line — and agree to be put into the line! — than can get EB-2 cards each year. An OPT-to-H-1B worker who gets sponsored by a green card in 2019 will be so far back into the overcrowded line that he must wait for 150 years to get the green card, say the Indian activists. In 2009, the EB-2 backlog was only six years for the last worker who got in the line during 2009, according to a chart posted by GC Reforms. But it climbed rapidly as more Indian companies paid their low-wage workers with green-card requests. In 2011, the line had exploded to 33 years for the last in line. In 2015, the line reached 93 years for the last worker. But the visa workers are not being swindled — they arrived as visa workers, they know about the overcrowded line, they know about the country caps, and yet they freely join the backlog while taking the U.S. jobs sought by American graduates. In short, the backlog was created by the outsourcing companies’ promise of benefits they cannot deliver to Indian outsourcing workers, and by the outsourcing workers’ willingness to stay in the backlog. Now the visa workers and the companies want Sen. Cramer and the federal government to change the rules to help themselves — regardless of the impact on Americans, on green-card applicants from other countries, or the nation’s ability to run its own information networks, develop new technology or manage its own healthcare, education, and research programs. Rep. Joyce Beatty, D-Ohio, Rep. Ami Bera, D-Calif, Rep. Earl Blumenauer, D-Ore, Rep. Suzanne Bonamici, D-Ore., Rep. Julia Brownley, D-Calif., Rep. Tony Cardenas, D-Calif., Rep. Andre Carson, D-Ind., Rep. David Cicilline, D-R.I., Rep. Yvette Clarke, D-N.Y., Rep. Steve Cohen, D-Tenn., Rep. James Comer, D-Ky., Rep. Jim Cooper, D-Tenn., Rep. Jim Costa, D-Calif., Rep. Joe Courtney, D-Conn., Rep. T.J. Cox, D-Calif., Rep. Jason Crow, D-Colo., Rep. Diana DeGette, D-Colo., Rep. Ted Deutch, D-Fla., Rep. Debbie Dingell, D-Mich., Rep. Michael Doyle, D-Pa., Rep. Eliot Engel, D-N.Y., Rep. Anna Eshoo, D-Calif., Rep. Adriano Espaillat, D-N.Y., Rep. Sharice Davids, D-Kan., Rep. Josh Harder, D-Calif., Rep. Sheila Jackson Lee, D-Texas., Rep. Pramila Jayapal, D-Wash., Rep. Eddie Johnson, D-Texas., Rep. Hank Johnson, D-Ga., Rep. Ro Khanna, D-Calif., Rep. Ron Kind, D-Wisc., Rep. Raja Krishnamoorthi, D-Ill., Rep. Ann Kuster, D-N.H., Rep. James Langevin, D-R.I., Rep. Rick Larsen, D-Wash., Rep. Al Lawson, D-Fla., Rep. Alan Lowenthal, D-Calif., Rep. Tom Malinowski, D-N.J., Rep. Doris Matsui, D-Calif., Rep. Lucy McBath, D-Ga., Rep. Betty McCollum, D-Minn., Rep. Donald McEachin, D-Va., Rep. James McGovern, D-Mass., Rep. Gregory Meeks, D-N.Y., Rep. Grace Meng, D-N.Y., Rep. Gwen Moore, D-Wisc., Rep. Joseph Morelle, D-N.Y., Rep. Frank Pallone, D-N.J., Rep. Jimmy Panetta, D-Calif., Rep. Bill Pascrell, D-N.J., Rep. Chellie Pingree, D-Maine., Rep. Kathleen Rice, D-N.Y., Rep. John Sarbanes, D-Md., Rep. Jan Schakowsky, D-Ill., Rep. Donna Shalala, D-Fla., Rep. Albio Sires, D-N.J., Rep. Adam Smith, D-Wash., Rep. Darren Soto, D-Fla., Rep. Jackie Speier, D-Calif., Rep. Eric Swalwell, D-Calif., Rep. Mark Takano, D-Calif., Rep. Dina Titus, D-N.V., Rep. Paul Tonko, D-N.Y., Rep. Norma Torres, D-Calif., Rep. Bonnie Watson Coleman, D-N.J., Rep. Peter Welch, D-Vt., Rep. Susan Wild, D-Pa., Rep. Rob Woodall, R-Ga., Rep. John Yarmuth, D-Ky., Rep. Jerrold Nadler, D-N.Y., Rep. Pete Aguilar, D-Ca., Rep. Stephanie Murphy, D-Fla., Rep. Suzan DelBene, D-Wash., Rep. Salud Carbajal, D-Calif., Rep. Nydia Velazquez, D-N.Y., Rep. Lois Frankel, D-Fla., Rep. Debbie Wasserman Schultz, D-Fla., Rep. Mary Scanlon, D-Pa., Rep. John Garamendi, D-Ga., Rep. Jared Golden, D-Maine., Rep. Sylvia Garcia, D-Texas., Rep. Joe Kennedy, D-Mass., Rep. Matt Cartwright, D-Pa., Rep. Bradley Schneider, D-Ill., Rep. Bobby Rush, D-Ill., Rep. Sean Patrick, D-N.Y., Rep. Kim Schrier, D-Wash., Rep. Conor Lamb, D-Pa., Rep. Brian Higgins, D-N.Y., Rep. Alma Adams, D-N.C., Rep. Alcee Hastings, D-Fla., Rep. Scott Peters, D-Calif., Rep. Robin Kelly, D-Ill., Rep. Derek Kilmer, D-Wash.